Tight Fist Tip #49: Drinking at the Bar? Drink Beer. In my last post, we determined that if staying in or pregaming, drinking shots is the Tight Fist friendly way to get drunk. But what if you've been dragged out to a bar, and are being forced to inebriate yourself at sobriety-inducing prices? As always we use our go-to benchmark: volume alcohol per dollar. 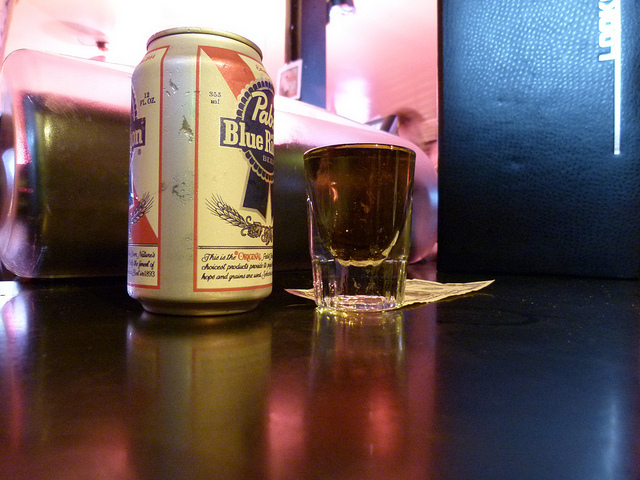 Let's start in the US, using the excellent DC dive bar The Mad Hatter as our pricing benchmark. I used happy hour prices (as I assume my followers are doing most of their drinking during happy hour), but the relative prices are indicative of normal pricing as well: a pint of beer and a well mixed drink are priced about equally, with wine being higher. So, how do they stack up? The beer is the winner, by virtue of it containing a bit more alcohol per drink than a mixed drink. But notice that it's pretty close- if you're at a bar with generous mixed drink pours or pricey beers, the balance could easily tip in the drinks' favor. Shot and a beer combo? Don't mind if I do. Here the beer easily defeats all comers, and the wine even edges out the spirits. And since the ridiculous Weights and Measures Act in the UK assures that you can never get a decent pour of a mixed drink, there is just no chance for the limey cocktail lover. So kids, the formula has been discovered: take (a lot of) shots before you go out, and then nurse a few beers at the bar. Drunk with a full wallet- it's a good life.